Evening Dresses There are 14 products. This very feminine dress by Jessica McClintock is quite pretty with plenty of lace, netting and chiffon. Tea length and dropped waist. It is a perfect dress for any formal event or even wedding. Vintage and created in the 1980's, this dress has a vintage inspired look of the 1920's. XL to plus size. 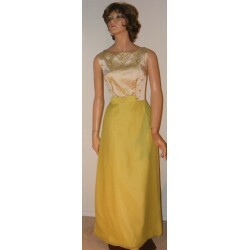 Beautiful brocade satin fabric embellishes the bodice of this sleeveless, chartreuse dress from the 1960's. 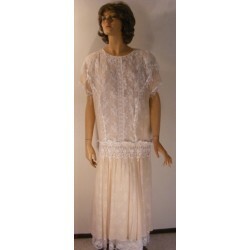 Lovely silk chiffon covers the slightly stiff lining of the skirt of this long dress. Slim fitting with a bow in front at the waist. 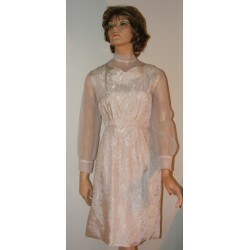 This semi-formal dress has a nice slim fit reminiscent of the 1960's or early 1970s. Elegant styling in a light/beige color floral brocade with sheer, chiffon long sleeves. More chiffon around the high neck. This dress looks great on it's own, but you could really show it off with some of your accessories! A good dress for a wedding or other event. 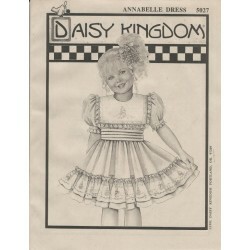 Daisy Kingdom girls and child dress Kit No. 5013. 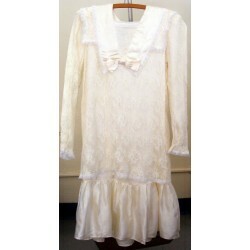 Includes pattern, fabric, and trim needed to sew a cute, little girl's dress. Vintage, from 1991. Double skirt with ruffle. Even 3 part, puffed sleeves. Princess seams. This would make a great dress for any special occasion or party! 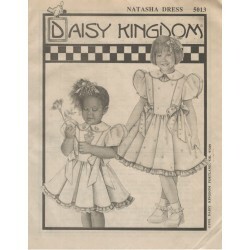 Daisy Kingdom girl's jumpsuit Kit No. 5029. Vintage, 1991. Sew a cute girl's outfit with the pattern and fabric in this kit. One piece pant suit with optional snap crotch. Has cute, sailor collar and is gathered at the ankles. Short puff sleeves. Pre-printed sailor bear and duck fabric piece. 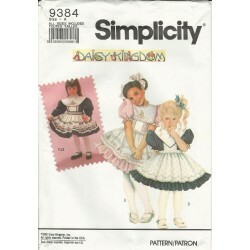 Sew a nice jumpsuit with this discontinued kit from Daisy Kingdom! 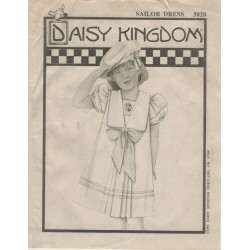 Daisy Kingdom sailor dress Kit No. 5028. Comes with pattern, fabric trim and even preprinted graphic panel of a Sailor Bear from the front. Everything you need to sew a cute dress for your favorite little girl. Vintage, from 1991. Short, 2 piece puff sleeves with headers. 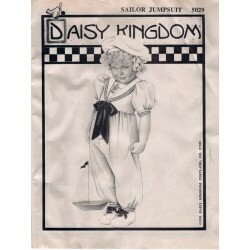 Sew a great sailor dress with this vintage kit from Daisy Kingdom!